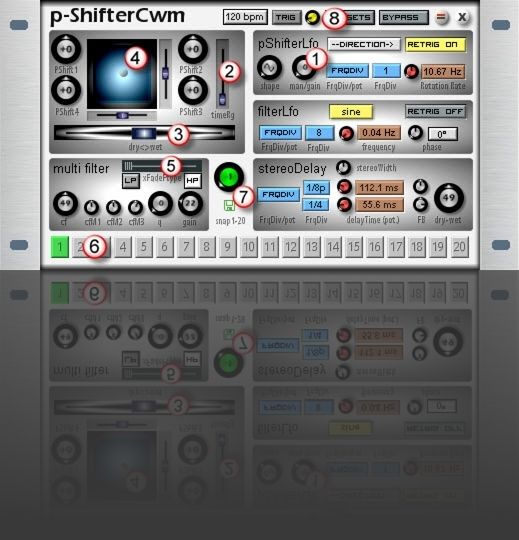 multi-fx device: four pitch shifters->multi filter->stereo delay. device has two inputs - left for the to-be-processed signal, right for a trigger signal (won’t be heard on output), to restart the lfos. there is a trigger gain poti (8), and a trigger indicator beside it. tweak the gain poti until you see the trig indicator flash when receiving a trigger signal. good trigger signals: anything with good punch, without attack, not too long (e.g. bd, sd, rim). the four pitch shifters (range -24 to +24) can either be used in parallel or serial mode. parallel (manual): set man/gain poti (1) to 0, and move the x/y control point (4) to the wanted position. serial (LFO): set man/gain to anything above zero, and the signal will rotate around the respective pitch shifters, at a definable speed of the pShifter lfo. pShifterLfo: rate can be set either according to midiClk(FrqDiv), or frequency poti (rotationRate). direction can be chosen and shape can be modified (soft <->hard fades). timeR[an]g[e] fader (2): higher values create more delay, but also a more drastic effect. dry-wet fader(3): fades between original and processed signal, which outputs to the multiFilter circuit. 12dB multiFilter: cutoff modulation sources are pShifter1 (cfm1), pShifter2 (cfm2), filterLfo (cfm3). both pShifter1 and 2 are sine waves. difference between them is that 2 is phase-shifted in relalation to 1.
xFadeFilter type (5): you can crossfade between Lp or Bp and Bp or Hp (use switches). filterLfo: rate can be set either according to midiClk(FrqDiv), or frequency poti. available waveforms: sine, squ, sawUp+down, random. stereoDelay: standard delays with max. 5461ms delay time. delayTime can be set either according to midiClk(FrqDiv), or delayTime poti. patterns 1-20: groups of almost all parameters can be recalled by using pattern buttons (6). the current pattern remembers the actual parameter settings. for use with midiCCs, assign a CC to the pattern select poti (7). pattern settings can be stored as presets.